Strawberry milk made good. Our breakfast drink is made from skimmed cow's milk and boosted with milk protein & fibre that makes these bad boys a great EASY start to the day. 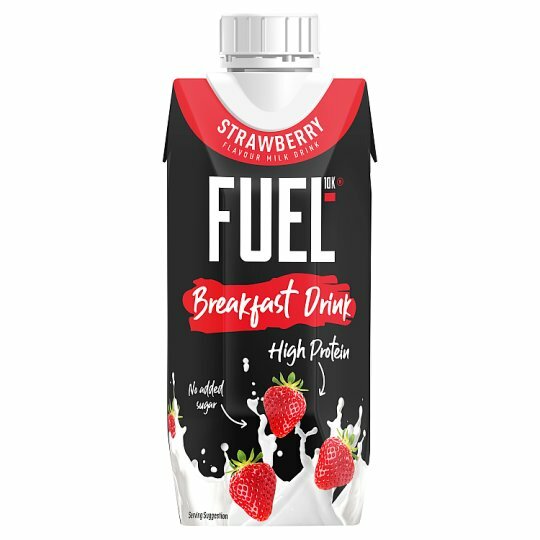 High in protein, a good source of fibre and no added sugar our strawberry liquid breakfast gets you up and running, whatever your goal may be. Wake up, fuel up, and get it on. Visit www.FUEL10K.com to find out more. Visit www.facebook.com/fuel10k to find out more. Our FUEL10K Breakfast Drink is all about high speed and high protein brekkie for active people. We've done the thinking for you as far as breakfast is concerned, so you can get on with whatever challenge is waiting out there. Each breakfast drink has 20g of protein, along with a good source of fibre, in a handy carton that means you can fuel up on the go. FUEL10K - Fuel Your Journey. Get Fuelled and Go for it! When you have something to aim for, something that stretches and tests your metal, something that triggers the endorphins when the seemingly mountainous becomes achievable. That rush, the adrenaline, that overwhelming feeling of... ‘I made it' - that's a great feeling. We've been there too. We've made it our mission to help you on your journey whatever the goal may be. We're bent on helping make mornings a little bit EASIER for you so you don't have to think too much while you get sorted for the day and focus on the job at hand. Shake well. Best serve chilled. Drink. Be Fuelled.